The arrival of humans and the animals they introduced has had a devastating effect on New Zealand’s natural environment. Since the 1960s there has been growing awareness of the need to conserve the land for future generations. Māori and then European settlers in New Zealand had a huge impact on the land, its plants and animals. For example, forests were burnt, introduced animals wiped out native species, and birds were hunted to extinction. Eventually, people began to realise the damage that had been done, and tried to repair it. In 1887, the paramount chief of the Ngāti Tūwharetoa tribe gave the mountains Tongariro, Ngāuruhoe and Ruapehu to the Crown. The area was made into Tongariro National Park, the country’s first. Since then, 13 more have been created. Increased tourism in the early 1900s led to the setting up of scenic reserves. From the mid-19th century, forests were cut down to clear the land for farms, but by 1950 it was clear that there were few native forests left. For the next 30 years there were arguments – some thought that forests should provide timber, while others wanted to save them for future generations. Cutting down trees meant that soil could be washed away in heavy rain, causing slips and floods that put lives and property at risk. Some areas likely to erode, such as hillsides, were replanted in trees. Introduced pests such as rats, stoats, possums and deer, which kill native species, were controlled by trapping, shooting, or poison. Some offshore islands are now free of predators, and threatened bird species have been moved there. When takahē, thought to be extinct, were found in Fiordland in 1948, it raised awareness of the need to save other animals in danger of extinction. Takahē and other rare birds have been bred in captivity to help increase numbers. In the mid-1960s people started to protest against damage being done to the environment. Major campaigns included ‘Save Manapōuri’, to stop the building of a high dam for hydroelectric power, which would have raised the level of Lake Manapōuri. 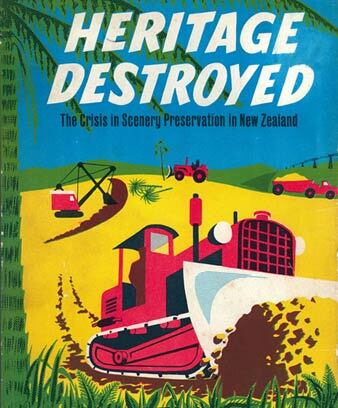 The Maruia Declaration, signed in 1975, called for an end to logging native forest. In 1986 the Ministry for the Environment was set up to look after environmental issues and planning. Parks, reserves, rivers, lakes and native wildlife are cared for by the Department of Conservation, set up in 1987.
biosecurity – making sure that plants, animals or other organisms which could harm the environment are not brought into the country.